EDLPS569 (2014) - Daniel Novak, Ph.D.
Research suggests that leaders matter to improving schools for all students, and that effective leaders need opportunities to continuously learn in and from their practice. But what kinds of environments, tools, and practices help leaders to improve the performance of their organizations? 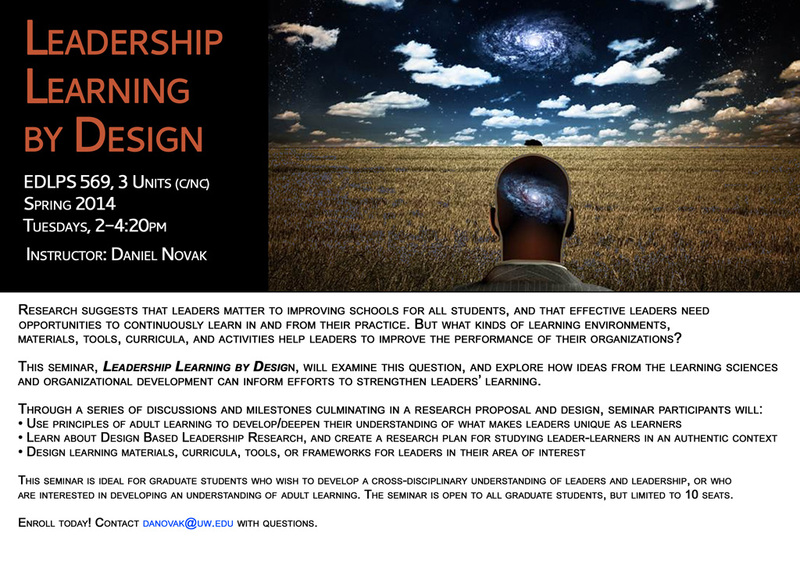 This seminar, Leadership Learning by Design, will examine this question, and explore how ideas from the learning sciences and organizational development can inform efforts to strengthen leaders’ capacity for learning and innovating. This seminar is ideal for graduate students who wish to develop a cross-disciplinary understanding of how adult learning theory applies to improving leadership learning and innovation in organizations. The seminar is open to all graduate students, but limited to 10 seats. In Leadership Learning by Design, participants build their research and design agendas over 10 weeks. In-class time is organized around a series of topics that will serve to deepen participants' understanding of how features of adult learning can support leaders' learning in their organizations. Project work time and guest lectures are built into each class. Each week, participants will proceed through a process of inquiry around the week's topic, with central questions that connect the perspectives from the readings, guest talks, and brief lectures to their project and research interests. Participants will also complete weekly short assignments that build into a final Design-based Leadership Research proposal. Ideally, these projects will be useful in participants' future work. Week 1: Design-based Leadership Research: What Can We Learn from Making Things for People? Each of these short documents contributes to the participants' final reports and presentations. In the spirit of Human-Centered Design Engineering, this structure works backwards from real world needs for a new kind of leadership learning to the development of empirical research questions that can be tested through the design. Dr. Novak will provide examples of past work for each milestone during Studio Time. Participants may request permission to customize the assignments to suit their particular research agendas and future goals.